When not travelling to exotic climes, by far the majority of my time working at the British Museum is spent at a desk. But every now and then it’s nice to escape the endless emails and infinitely multiplying spreadsheets and take a look at some of the more exciting things my colleagues are working on. It is all too easy "to lose sight of the objects for the museum" when subsumed by the day-to-day drudge of deskwork. Hence it’s a real treat to leave the computer screen once in a while and remind oneself what working in a museum is really all about. And sometimes you find your colleagues are working on something very special indeed. 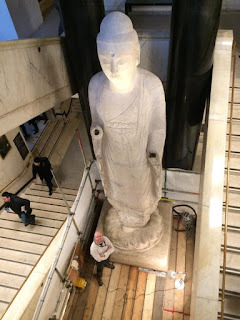 I got one of those lucky chances around this time last year, when I was invited to take a closer look at the BM’s magnificent Amitābha statue. This colossal white marble figure of Amitābha, from ancient China, stands in the north stairwell of the BM’s King Edward VII building, almost 6 metres in height. Ever since I first visited the BM, when I was around 9 years old, this has been one of my favourite pieces in the Museum. There is something about the poised serenity and warmth of Amitābha’s face, the neatly composed folds of the drapery of his robes, and, of course, the pure white brilliance of the luminous marble from which he has been carved. There are stylistic parallels to the great cave temple sculptures, conveying here the spiritual power and the regal majesty of the divine Buddha as cosmic saviour. He looks, to me, like a giant version of the later elegant ivory-white porcelain blanc de Chine figures for which China is also famous. Each morning, as I climb the empty stairs on my way to my desk, and again, as I leave in the evening, I like to say ‘good morning’ and ‘goodnight’ to Amitābha – one of the first and last familiar faces I see each day at work. 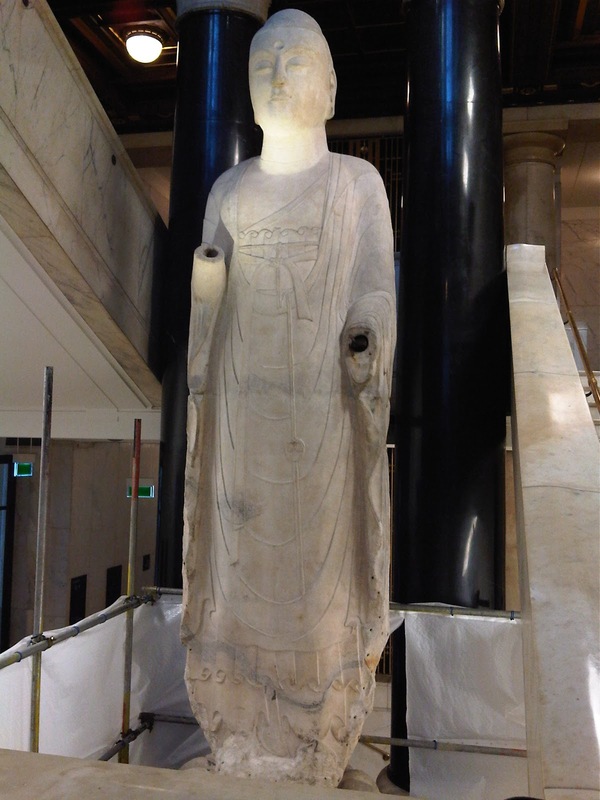 More than 1400 years old, work on creating this statue of Amitābha was finished in AD 585 (the 5th year of Kaihuang), during the Sui dynasty (581-618), shortly before the high era of Chinese Buddhist art flourished during the T’ang dynasty (618-907) which followed. I’d always been interested in how this huge work of art had found its way to the British Museum. 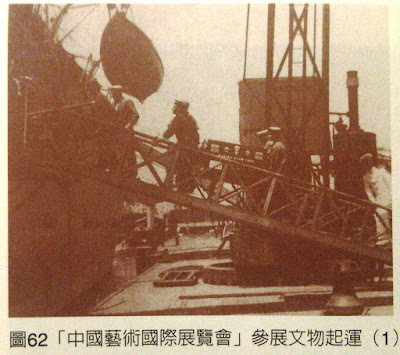 Its label states that it was a gift of the Chinese Government in 1938. 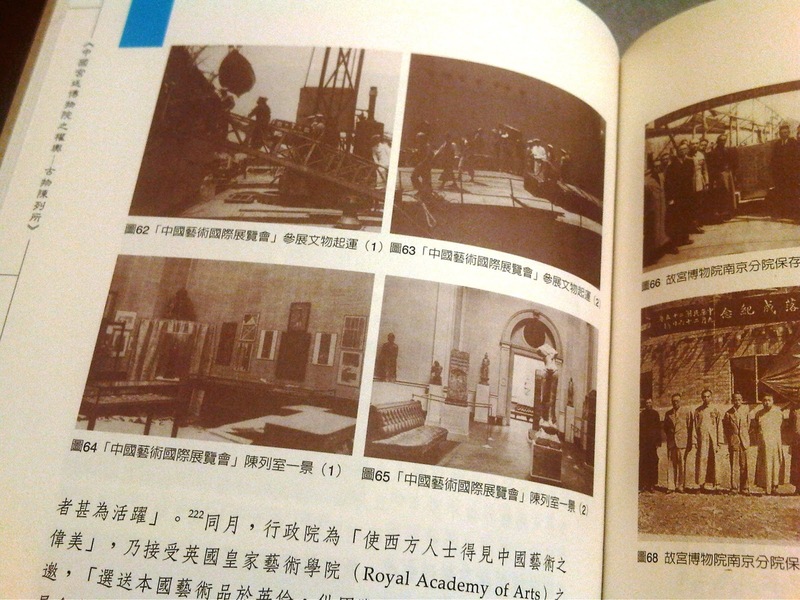 But it first came to London and was originally exhibited at the Royal Academy in 1935-1936 as part of the very prestigious International Exhibition of Chinese Art, which at the time was the largest showing of Chinese art in the Western world. 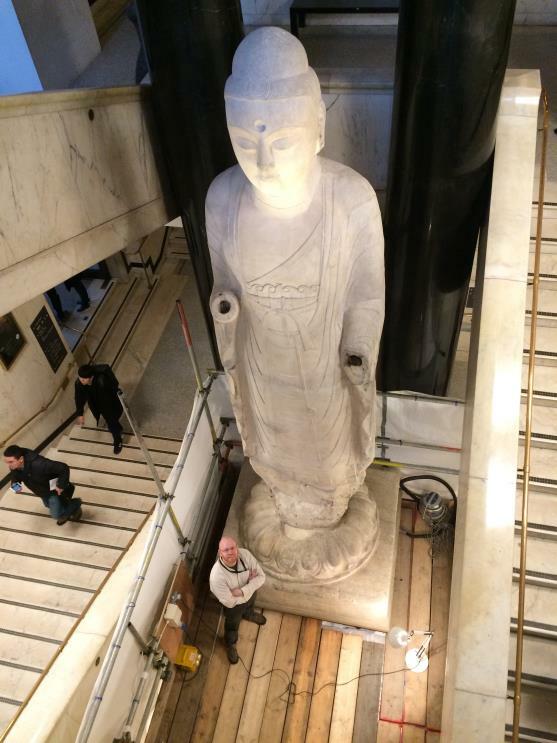 Thereafter the statue was given to the UK to mark the success of the exhibition (you can see photographs of Amitābha at the Royal Academy being installed here and on display here). The importance of that exhibition is still recalled today, particularly in Taiwan, where the Republican Government of the time retreated following the Communist Revolution of 1949. Some years ago now, when working at the National Palace Museum in Taipei, I was intrigued by the very robust and secure-looking packing cases which the NPM uses to safely transport their collection; mentioning this to a friend of mine who works at the NPM he showed me a photograph from a book he’d written which illustrated how these packing cases were still being made today to a similar design as those first used to transport the artworks to the London exhibition in 1935; therein lies the ubiquity of good design! From November 2015 to January 2016 my colleagues at the BM conducted a project of detailed research and comprehensive conservation on the Amitābha statue (see here). 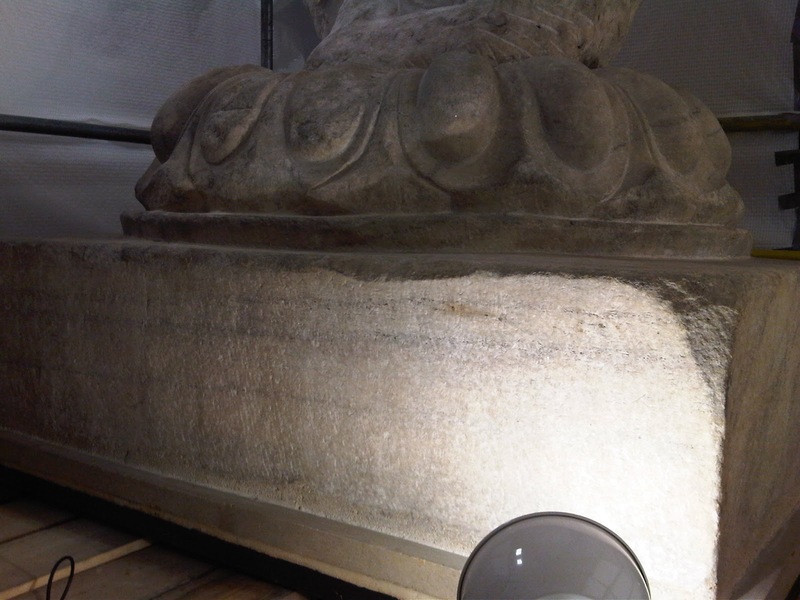 A series of platforms and scaffolding was erected around the statue which enabled the very close and intensive work to take place. 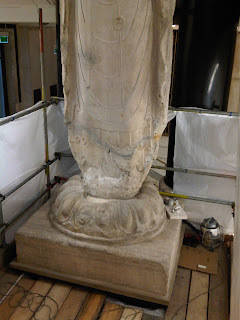 This research project enlightened us by answering a number of unknowns about the sculpture, such as hints towards what would have been its original polychrome appearance. 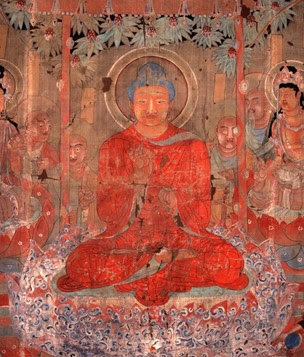 Minute traces still extant on its surface suggest that the white marble of the robes would once have been painted a brilliant orange-red with bright green sleeves, similar to this painting (also in the BM’s collection) of the Buddha (probably Śākyamuni) preaching from Dunhuang (c.701-750). 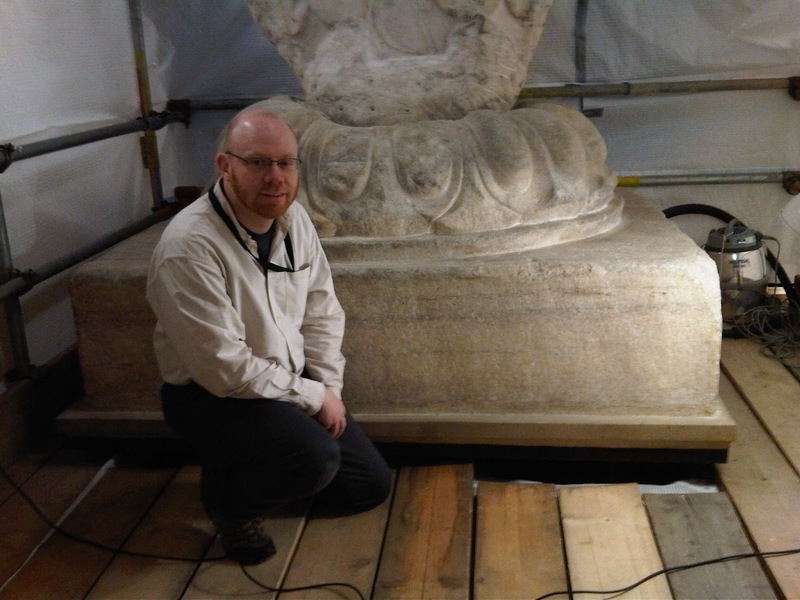 I was lucky enough to be invited to take a closer look at the inscription on the statue’s base. 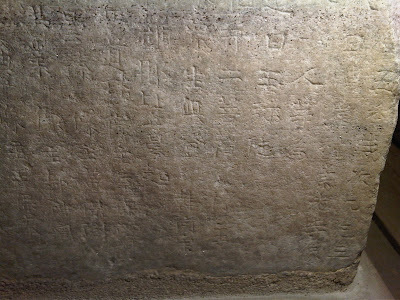 The Chinese characters are very finely incised, hence they aren’t immediately obvious, but they can easily be read if a raking light is used. The dedication lists the patrons who commissioned the construction of the statue of Amitābha for their village temple, called Chongguang in Hancui. 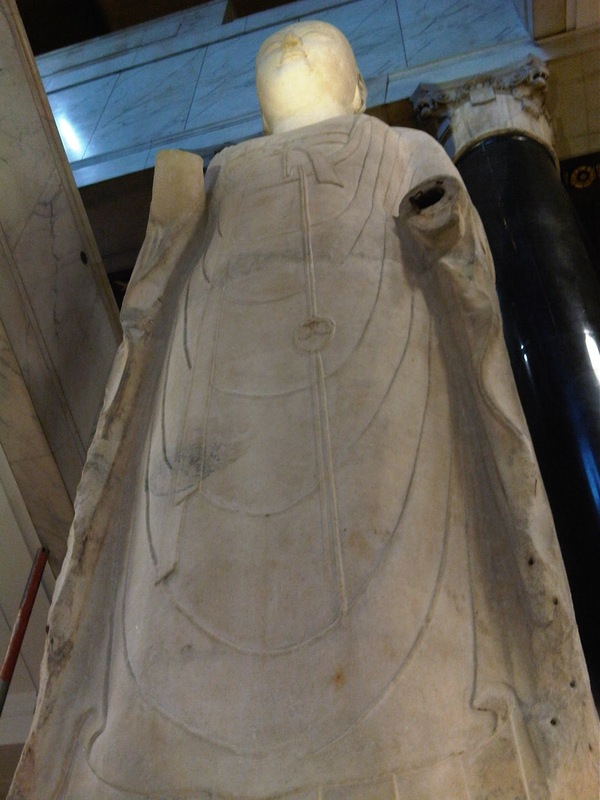 Sadly it’s not been possible to identify Hancui village today, but it’s thought to have been located somewhere to the southwest of Baoding in Hebei province, which is a region known for its white marble sculptures. An article in the recent issue of The British Museum Magazine (see below) gives greater detail and insights into the sculpture’s cultural background and the science of the research project to clean and conserve this remarkable embodiment of Amitābha, the bearer of infinite light.